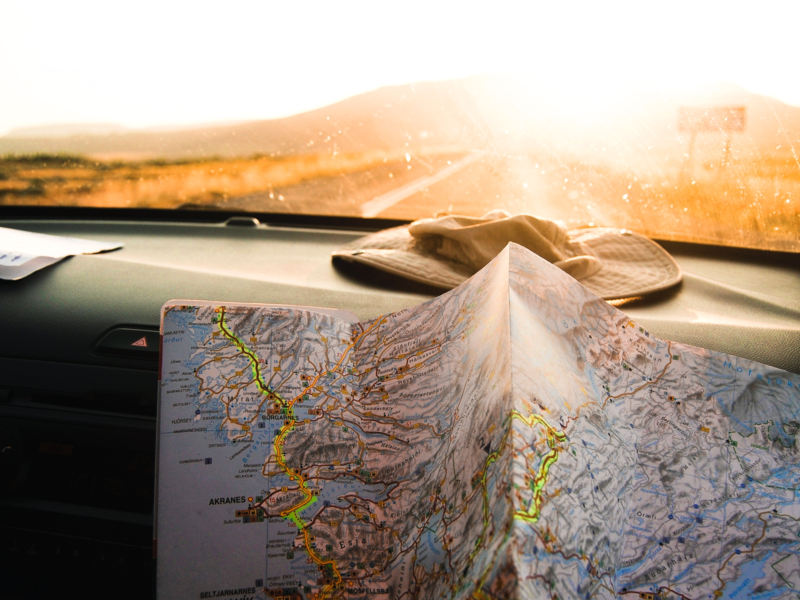 Why travel if you aren’t going to get a little lost? I realize I am in Champaign, and I want to be in Bloomington. I am without cellphone or GPS, so I resort to the navigation techniques of a distant age: I stop and ask for directions. “I-39,” I say again. He looks confused. Since I am the one who is lost, I try to avoid any hint of condescension or bewilderment. “It’s, uh, an interstate highway.” He still has no idea but checks his phone. To be fair, I-39 turns out to be a full 60 miles away. I try to maintain an expression that says, “Oh, I’m not that lost—maybe just confused I-72 with I-74 a little.” They’re only one digit apart. I am without cellphone or GPS, so I resort to the navigation techniques of a distant age: I stop and ask for directions. A black man with hints of gray in his scruffy beard approaches the counter with a large bottle of carbonated high-fructose corn syrup as the clerk holds his phone at different angles and tries to translate the rotating map into directions. The newcomer knows where I-39 is. In fact, he seems excited by the novelty of the situation and takes me outside so he can literally point me in the right direction. “You want the exit for Peoria,” he says with enthusiasm. He is wearing baggy shorts and a T-shirt, and he has the manner of somebody’s favorite uncle, one of those gregarious good souls who genuinely like to help people. I am glad to have confused my midsized central Illinois cities. “I’m living in Europe and visiting for the summer,” I say, a little embarrassed. But he is delighted. “Didn’t think I’d meet somebody from a different country!” he exclaims, shaking his head. I don’t explain that I am really only studying in Europe but am from no place more exotic than Minnesota. He heads for a beat-up minivan, then realizes he forgot his pop—yes, in Minnesota, it is pop—on the counter inside. We laugh and wave goodbye. I have an extra 60 miles of cornfields to reflect on the encounter, and it makes me smile. I am glad to have confused my midsized central Illinois cities. Why travel if you are not going to get a little lost? I have loved to travel since I made a bargain with my dad in high school—I would learn Italian if he took me to visit his cousins in Italy. A shrewd deal for both of us. Later I spent two years in the Peace Corps in Kazakhstan; later still, as part of my Jesuit formation, I managed to get from St. Paul, Minn., to the Shrine of Our Lady of Guadalupe in Mexico City with $35, a Greyhound bus ticket and the earnestness of a novice. Now, a full decade later, I find myself on the road and in the air more often than I have been for years. I have just been ordained in Milwaukee—something that cannot happen over Skype—then it was back to Rome for exams, then back again to the States to visit all the people and places that have been important to me on the long journey of Jesuit formation. Illinois, where my brother and grandmother live, is the summer’s homestretch. It is the inefficiencies of the journey, as much as the sights at the destination, that give travel its depth. In between, I managed a trip to Burkina Faso and Ivory Coast for the ordination of two West African Jesuit friends. There—at that inevitable moment a week into the trip when the most urgent question in life suddenly becomes “Where did I pack the Imodium?”—I had occasion to ask myself: “Do I really still like traveling? Is it worth it?” Since I was not going anywhere for the next couple of days while the Ivorian fauna worked its way through my digestive tract, I had plenty of time to think about the question. And, of course, that time to think was itself an answer. It is the inefficiencies of the journey, as much as the sights at the destination, that give travel its depth. My favorite moment in Africa came the evening after my friend’s ordination in Dedougou (Burkina Faso’s answer to Milwaukee). After the post-celebration lunch, we spent the afternoon on earth roads—with potholes cunning enough to swallow your car when filled with water—that wound through a landscape of eucalyptus trees, herds of goats and swine and farms still cultivated by hand, where sorghum and rice are stored in squat brick cylinders with pointy thatched roofs. If there is not a little discomfort, you probably have not left home. Covered in the red dust of the journey, we finally arrived in a village where the prospects of a shower were murky and air conditioning was just a cruel memory. But we had no exams to prepare for, no commitments until the morning and Burkinabe beer and the stars to entertain us. My friend mused about the values of village life. “Here people listen to their grandmothers,” he said. It was the best night of the trip. The displacement of travel gives us the freedom to muse. The road requires a certain asceticism, however, to have that effect. In Rome, I am constantly bumping into tourists texting their latest selfie to another time zone. I do not notice them, and they do not notice me. Travel without pauses is like a musical piece with the notes crammed breathlessly together, like poetry without meter, form or punctuation. It is the spaces in between—watching the planes take off at the airport, swatting mosquitoes in the village, driving through long stretches of Midwestern farmland—where ideas can simmer without deadline. Something similar happens when praying the rosary or in the liturgy. The repetitions and silences give God the space to speak. Of course, airport chairs are uncomfortable, unanticipated delays are boring, and Iowa really does go on forever. But if there is not a little discomfort, you probably have not left home. It is not an accident St. Ignatius Loyola instructed that his novices be tested by pilgrimage. If anyone appreciated the value of discomfort to stretch, humble and change us, it was Ignatius. So I reach again for the Imodium; I sew a button back on my only pair of clean pants with dental floss; I bumble to communicate in a language not my own. I stop and ask for directions. And I laugh because I have driven 60 miles in the wrong direction, but the sign ahead says Peoria. This article also appeared in print, under the headline "Wrong Turns: Why travel if you are not going to get a little lost?," in the February 19, 2018 issue.